Drumlins are elongated hills, with streamlined shape. They occur in groups with similar orientation. The name "drumlin" is Irish, and there are thousands of them in that country. In 1865 the drumlins of Ireland were attributed to glacial movement by H.M. Close. Since then, almost all writers on the subject of drumlins have assumed they are of glacial origin, although no mechanism for drumlin formation by ice action has been discovered. When considered as the effects of currents of the deluge, drumlins can be quite easily explained. Their distribution patterns provide information about the way in which the flood waters retreated from the land. Drift and bedrock would be eroded differently by an ice sheet, yet drumlins of both types may occur in the same drumlin fields, having similar form and orientation. Cross stratified sand and gravel in drumlins is believed to have been deposited during the melting of the ice sheet, but if this were so, the ice sheet would no longer be available to shape the surface of the drift into drumlins. The pattern of stratification in the sand and gravel in many drumlins shows no signs of disturbance by the weight of a vast ice sheet scraping over it. The direction of orientation of drumlins in some regions shows that the direction of flow was uphill. This is explained in the glacial theory as due to the greater thickness of ice at the rear, causing a lateral thrust of the ice sheet. But the drumlins at higher levels are more intricately streamlined and show a faster rate of flow, which could not occur if the ice sheet was being pushed against gravity. Rock basins occur in some drumlinized areas such as the Finger Lakes of New York. The excavation of deep rock basins probably could not be accomplished by ice erosion, and the concept is inconsistent with the ice simultaneously flowing over the drift without disturbing the patterns of stratification in sand and gravel. The bedrock below the drift is striated but usually has not been streamlined. The striations are attributed to moving ice, but it seems inconsistent to believe the ice slid over both the surface of the drift, and the surface of the bedrock at the same place. Drumlins in some regions have been modified by a change in the direction of flow of the agent of streamlining. Crossing patterns of orientation also occur. Even a small change in the direction of motion of a glacier would most likely have obliterated previously formed drumlins. The drumlin form seems inconsistent with ice erosion, which would tend to have a leveling effect rather than molding the country into streamlined hills. There are no deposits of the ice sheet lying above the streamlined surface in drumlin fields, that could have been deposited during the melting of this last ice mass. Yet many drumlins are attributed to erosion by the ice sheet, which would tend to result in accumulation of debris in the glacier. Existing ice sheets do not form drumlins. J. K. Charlesworth stated: "An appeal to modern glaciers is unavailing, since drumlins in statu nascendi are unknown though accumulations somewhat resembling them have been described from time to time." To account for drumlins by the action of ice sheets, some physiographers have attributed a mysterious "rhythmic" property to the ice sheets of the past, which caused the molding of drumlins from both bedrock and drift as the ice moved across the countryside. This rhythmic quality, it is suggested, caused erosional processes to shape drumlins from hard bedrock, while depositional processes formed drumlins having the same shape and orientation at the same time. A study of glacial flutings in bedrock in Greenland cited this proposed mechanism, and referred to the possibility of ice flow in "tubular vortices:"
To operate the lateral transport of material in the ice, or the rhythmic variation in the intensity of erosion, Shaw invoked ice flow in tubular vortices, which could possibly be generated by the lateral pressure gradient arising from longitudinal crevassing in the glacier. Streamline effects of currents are evident in the beds of streams. One of the earliest scientific accounts of drumlins was a study of the parallel ridges of Edinhurgh, Scotland, in which these landforms were compared with sand bars and sediment accumulations behind obstacles in the beds of streams. Hall claimed these diluvial waves not only formed streamlined hills, but swept along great volumes of drift, with erratic boulders derived from sources in the north, and deposited this load of debris on the lee sides of rock outcrops in Scotland. All this, Hall believed, could be reconciled with the Huttonian Theory. The shape of drumlins indicates that fluid flow and sediment transport has been involved in their formation. The process of streamlining in the formation of sandbars and snowdrifts involves both deposition and derosion. The erosion occurs at the stoss end while deposition occurs at the lee end of the bed form. Large scale landforms in eastern and central Washington and other regions have been identified with the effects of diluvial currents by J.L. Cunningham , who noted these so-called glacial deposits were similar to the effects of currents, and questioned their supposed glacial origin. Streamlining of hills into the drumlin form is demonstrated from observation of the effects of the catastrophic floods on the Columbia Plateau in eastern Washington. The drumlins in other areas may have an origin similar to that of the drumlin-like loess hills reported by Baker. They would thus have been formed from unconsolidated material. My theory is that bedrock drumlins were formed when the rock was unconsolidated. This would be reasonable if these sediments were deposited during the flood, and eroded when the continents were elevated at the end of the flood. The troughs between drumlins may have been the sites of longitudinal vortices in the currents. Folk described the vortices as not remaining fixed in position, but "they wander back and forth like a swarm of slithering snakes." The mobility of vortices would have the effect of rounding the crests of the drumlins. As the depth of water decreased, the vortices would tend to be concentrated in the troughs, where erosion would be intensified. Material from the troughs would be deposited on drumlins located downstream. The role of longitudinal vortices was crucial in the formation of drumlins, in this fluvial interpretation. It seems obvious that where flood waters flowed rapidlv over flat plains of unconsolidated sediments, a streamlined bed would develop. Rapid currents have momentum, and patterns of drumlins are due to the momentum of the currents. The form of drumlins is one which minimizes turbulence. The lithification of the streamlined sediments formed the bedrock drumlins. Most of these were subjected to disintegration, resulting in drift drumlins. Intermediate types, containing part drift and part bedrock, occur where the disintegration surface penetrated only part of the drumlin. Erosion followed disintegration in some areas, resulting in the redeposition of drift along the flanks of the drumlins. Studies of the bedrock profile in drumlin fields show a marked contrast exists between the streamlined surface topography and the irregular shape of the bedrock. Geologic sections showing the erratic shape of the bedrock below a drumlinized area were illustrated by S. Aronow, in a study of drumlins in North Dakota. The depth to bedrock in the region varied from 0 to 200 feet. The structure of drumlins in southeastern Wisconsin has been studied by W. C. Alden. Records of wells drilled on or around drumlins showed a great variation in the structure of the drumlins. Some consisted mostly of drift, others were mostly bedrock, covered with a thin veneer of drift. The depth of the drift in the area was variable, in places reaching as much as 300 feet. From the point of view of the glacial theory, the surface of the bedrock below the drift ought to have been streamlined and worn smooth by the movements of the ice sheet, rather than the surface of the drift. But in drumlin regions the opposite conditions exist. The erratic shape of the bedrock below drumlins is explained by the varying degree of penetration of the surface of disintegration as the drift was formed. The contrast between the bedrock surface and the drift surface exists because each surface was formed by different processes; one by a rock disintegration process, the other by the streamlining action of currents. This concentric structure within some drumlins can be explained in terms of the disintegration process. The surface of disintegration may have penetrated down into the drumlin in planes conforming with the streamlined shape of the drumlin surface. The idea of rock disintegration in situ forming the drift solves the enigma of the varying composition of the drumlins. Erosion by ice sheets would not form hills of bedrock with the same form and dimensions as hills of drift being deposited at the same time. The patterns of drumlins reveal the immense scale of the events which caused them. For the drumlins to have been formed with parallel alignment, they must have been contemporaneous. Vast areas of the world have been swept by streamlining currents of the flood. Drumlins show a trend of the current flow from the north, that can be explained by rapid elevation of tlne polar regions at the end of the flood. Flow of the waters across the continents, and locally down valleys towards the oceans, caused streamlining of the landscape. One of the largest and most remarkable drumlin fields in the world occurs in northwestern New York, where the drumlins number about 10,000. About 7,000 drumlins occur in southern Ontario. East-central Wisconsin has about 5,000 drumlins; in south-central New England there are about 3,000, many of which consist of rock. In Nova Scotia, there are 2,300 drumlins. One of the most curious facts about patterns of drumlins is the uphill orientation in many areas, that shows flow of currents over hills, escarpments, and from out of the sea. In north central New York the direction of flow was from out of the region of Lake Ontario, uphill towards the Allegheny highlands to the south. A group of drumlins east of Owen Sound, Ontario, indicate a flow direction from out of Georgian Bay, uphill towards the Niagara Escarpment. 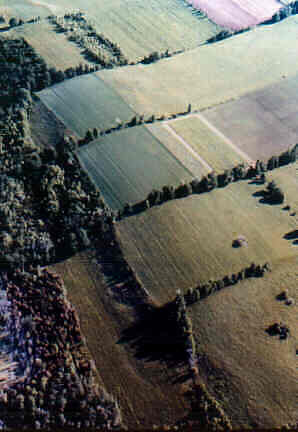 A fan shaped pattern of drumlins south of Green Bay, Wisconsin, shows a similar uphill flow. In Ireland, patterns of flow attest to diluvial action, rather than glacial movement. Flow direction was from out of the sea at Belfast Lough, over rising ground to the south. The direction of flow of the currents which shaped the drumlin field in Northern Germany was from out of the Baltic, fanning out across the lowlands. The drumlins vary in form from oval hills to very long, low profile flutings. There may be a transition from one kind to another in a drumlin field. Further south they became better streamlined, and tendled to be grouped in clusters. Still further south, on the rising slopes of the Allegheny Upland, the drumlins were smaller, more intricately streamlined, with steep sides and narrow crests. In the region of the Cayuga trough the drumlins became elongated flutings. These variations in drumlin form show the agent of streamlining was faster at the higher altitudes to the south. Such an increase in the rate of flow would not be possible if the drumlins were shaped by an ice sheet being pushed uphill by a thicker ice mass to the north, which could not move faster than the ice mass causing the push. But the increase in speed is what would be expected if the drumlins were shaped by diluvial currents. The continuity of stream flow requires the velocity of the currents increases where the bed is rising. The form of the New York drumlins shows this increased rate of flow where the depth of water was less. In the diluvial environment, there was a continual decrease in the depth of the waters as the continents emerged. Successively lower shore lines in many regions attest to the lower water levels. Drumlins also record the effects of the decreasing depth of the flood waters as they were formed. In some regions the drumlins have been modified by currents subsequent to their original formation. Examples of multiple drumlins, consisting of several small drumlins clustered on the same base, were reported by Alden  in Wisconsin, and by Fairchild in New York. The form of the initial drumlin can be detected in these clusters. In the diluvial environment, changes in the depth of the water as the continents emerged would cause the vortices to become smaller, resulting in the reshaping of large drumlins into smaller ones. The changes in the direction of flow of the currents could have resulted from shifting of centers of uplift, spilling the waters in a different direction. Changes in the direction of flow of the currents could also have been caused by the elevation of highlands above water level, forcing the currents into new channels. This may have occurred in central New York as the Allegheny highlands were elevated above the water level. There are several indications that vertical movements of the earth's crust were a major aspect of the flood. Present ideas about the earth's composition do not provide an easy mechanism for the amount of vertical movement which is indicated by the earth's surface features, but a phase change in a subcrustal ice layer, at the end of the flood is a possible mechanism that could cause uplift. In the central Great Lakes region, the sediments thicken in the Michigan Basin, and rock formations are tilted up at the perimeter of the basin. At the rim, where the sediments were not compacted, since the horizontal compression was less, there has been great erosion of the sediments by the currents. Erosion of these sediments has formed cuestas with steep escarpments, and deep lake basins (such as Georgian Bay) at the perimeter of the Michigan Basin. The orientation of the drumlins in New York and southern Ontario shows the direction of current flow which caused the drumlins was mainly in the direction of dip of the sedimentary strata, indicating the uplift which tilted the strata also initiated the currents that shaped the drumlins. Many of the drumlins in the vicinity of the Niagara Escarpment are oriented normal to the trend of the escarpment, as would be expected if the currents which formed the drumlins also eroded the escarpment. In the diluvial theory, the escarpments and drumlins were formed by the same events, so there is a natural relationship. Major patterns of drumlins were determined by differential uplifts of the earth's crust which are evident in the tilt of sediments originally deposited horizontally. Warping of abandoned shorelines is another clear indication of crustal uplift. The regions of maximum uplift can be determined by following the ascending shorelines. In the Great Lakes region it seems to be a general rule that these areas were sources of the flow indicated by the patterns of drumlins. The glacial explanation of drumlins encounters major contradictions and flaws, while the alternative interpretation in terms of rapid water current flow provides consistent and reasonable answers. Currents of flood waters shaped previously deposited sediments while these were unconsolidated. After the sediments were streamlined, there was disintegration of the surface rock, producing the drift, the process penetrating to varying depths. Not all drumlinized areas were affected by the disintegration, so drumlins of bedrock occur together with other types consisting of drift or part drift and part bedrock. Cox, D.E. 1976. Problems in the glacial theory. Creation Research Society Quarterly 13(1):2.534. Fairchild, H.L. 1905. Ice erosion theory a fallacy. Geological Society of America Bulletin 16:13-74.
von Engeln, O. D. Glacial Geomorphology amd glacier motion, American Journal of Science, (5th Series) 23.5(210):426-440. Howorth, Sir Henry H. 190.5. Ice or Water, Volume 1. Longmans, Green and Co., London. p. xxxiii. Hall, Sir James. 1815. On the revolutions of the earth's surface. Transactions of the Royal Society of Edinburgh, 7:139-212. Charlesworth, J. K. 1957. Op. cit., p. 254. Cunningham, J.L. 1976. Glacial deposits vs. flood deposits. Proceedings, Third National Creation Science Conference. Bible Science Association, Caldwell, Idaho. pp. 251-256. Cox, D. E. 1979. Controversy about ice ages. Creation Research Society Quarterly, 16(1):21-28. Folk, R. L. 1976. Rollers and ripples in sand, streams and sky: rhythmic alteration of transverse and longitudinal vortices in three orders. Sedimentology, 23(5):649-669.
von Engeln, 0.D. Op. cit., p. 434. Cox, D.E. 1975. The formation of cross stratification: a new explanation. Creation Research Society Quarterly, 12(3):166-173. Flint, R.F. 1971. Glacial and Quaternary Geology. John Wiley and Sons, Inc., New York. p. 104. Aronow, S. Op. cit., p.196. Cox, D.E. 1977. Kames, eskers, and the deluge. Creation Research Society Quarterly, 14(1):47-52. Fairchild. H.L. 1907. Drumlins of central western New York. New York State Museum Bulletin No. 111. Flint, R.F. Op. cit., p. 100. Miller, J.W. Jr. 1972. Variations in New York drumlins. Annals of the Association of American Geographers, 62(3):418-423. Alden, W.C. Op. cit., pp. 22-25. Fairchild, H.L. 1907. Op. cit., p. 409. Thwaites, F.T. 1957. Outline of glacial geology. Edwards Bros., Inc. Ann Arbor. p. 44. Miller, J.W. Jr., Op. cit., p. 421. Cox, D.E. 1979, Op. cit.